Kiel, the chief naval port of Germany on the Baltic, was a town of the Prussian province of Schleswig-Holstein. The population in 1900 was 107,938; (1905), 163,710, including the incorporated suburbs. It is beautifully situated at the southern end on the Kieler Busen (bay or harbor of Kiel), 70 m. by rail N. from Hamburg. At the beginning of the 20th Century it consisted of a somewhat cramped old town, lying between the harbor and a sheet of water called Kleiner Kiel, and a better built and more spacious new town, which had been increased by the incorporation of the garden suburbs of Brunswick and Dusternbrook. At Kiel were the naval technical school, an arsenal, and dry and floating docks. After the German-Danish war of 1864 the Danes lost the Duchies of Schleswig, Holstein and Lauenburg. Holstein went to the Austrians and the others to the Prussians. Kiel was in the peculiar position of being administered by the Austrians whilst the Prussians controlled the harbour, the waterway and Friedrichsort Castle. At that time Kiel was still a small university and trading town of about 20.000 inhabitants. Under the "Garsteiner Convention" of 1865 the Prussians were formally granted Kiel as a naval base and on the 24th June that year, Admiral Jackmann brought the Prussian fleet from Danzig and established the Baltic Naval Base in Kiel. Following the Austrian-Prussian War of 1870 the North German Federation Navy became the Kaiser's Navy and Kiel was declared a State Naval Harbour. This caused the base to be expanded and marked a considerable change in the economic fortunes of the city. The war harbor of Kiel is perhaps the best example of its kind. The fortifications, consisting of the Friedrichsort, and Falkenstein forts on the Schleswig side of the harbor, und four powerful shore batteries on the Holstein shore, are situated at a point about four miles north of the city, where the harbor is narrowest. The naval station is situated on the eastern side of the harbor, near Ellerbek, directly opposite the old city. In this district are the Imperial shipyards, with two large basins, connected by a canal ; three shipways for the launching of newly built ships; four dry-docks; a floating dock; and a haven for torpedo boats. To the southwest of the station are various large private ship-building and iron works. Kiel was not only the premier dockyard and naval arsenal, but the principal stronghold in the Baltic. The bay is six miles long, and the entrance but narrow, so that the problem of defense against attack from the sea is not a difficult one. 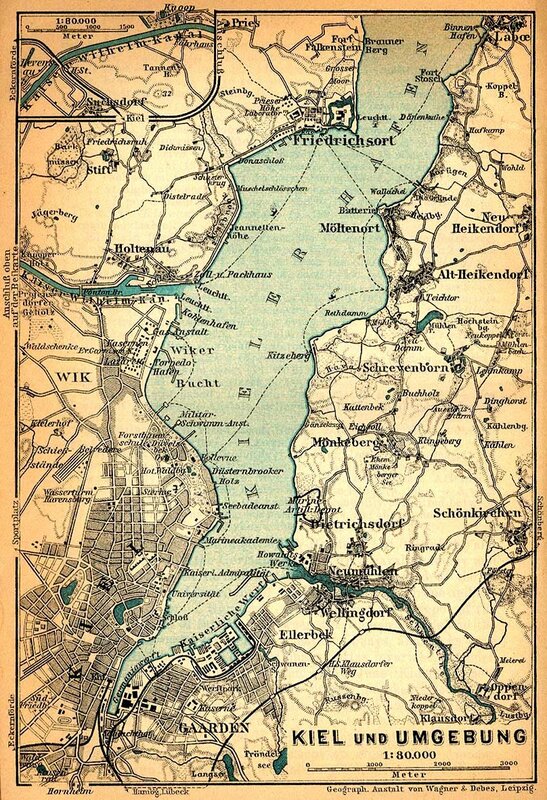 Further in the bay widens, until between the canal locks at Holtenau on the west side and Heikendorf on the other shore it is 5500 yards broad. Clustered at the entrance is a series of forts and redoubts, some old, but others new. The outlying works are Fort Herwarth and Fort Falkenstein, and further up the bay are the battery of Friedrichsort, Forts Stosch, Jagersberg, Korugen, and Moltenort. In all, there are, or were before the Great War, 90 guns mounted in these works, comprising 78 94-inch pieces and two batteries of 6-inch quick-firers. The landward approach to the harbor is dominated by Fort Herwarth, Robsdorf, and Holtenau. Robsdorf lies on the east side of the bay, near the bathing beach at Laboe, and is connected with Forts Stosch and Korugen by a sunken road It is claimed that the turret guns at Robsdorf have a range of 33,000 yards. At Friedrichsort arrangements existed to close the harbor entrance by a boom, and at the same place there was a large mine depot. To each of the two Naval ports of Kiel and Wilhelinshaven a Vice-Admiral was appointed as "Marine Stationschef" (Commander-in-Chief of the Station) for the Baltic and for the North Sea respectively. These Admirals were also in command of the Naval port district, Com- including the forts. All the vessels, dockyards, and Naval resources within the jurisdiction of the station are under their authority, excepting the vessels of the " First Squadron." The Ships Examining Commission at Kiel was responsible for the trials of ships, more especially of new ships, and for the testing of the efficiency of their fittings. At its head was a senior captain or Rear-Admiral. The pride of Kiel was its magnificent harbor, which had a comparatively uniform depth of water, averaging 40 ft., and close to the shores 20 ft. Its length is 11 miles and its breadth varied from 1/4 mile at the southern end to 4-1/2 miles at the mouth. Its defences, which include two forts on the west and four on the east side, all situated about 5 miles from the head of the harbor at the place (Friedrichsort) where its shores approach one another, made it a place of great strategic stength. The imperial docks (five in all) and ship-building yards were on the east side facing the town, between Gaarden and Ellerbeck, and comprised basins capable of containing the largest war-ships afloat. The imperial yard employed 7,000 hands as of 1910, and another 7,000 were employed in two large private ship-building works, the Germania (Krupp's) and Howalds'. Engine-room artificers, quartermasters, and torpedo-men were prepared at the Warrant Officers' School at Kiel for the examinations to be passed by them prior to promotion. These schools were purely technical schools, their sole object being to teach the pupils the special knowledge required in their particular branch. The Warrant Officers' School was under the supervision of the Education Inspection Department of the Navy. The head-master of the school was a pensioned captain (zur Disposition). The Naval School at Kiel prepared Naval cadets to become officers. The examinations to be passed by midshipmen and cadets on entering the Navy, and while on board the training-ships, were held at this school. The large number of special branches of science with which Naval officers were concerned led to instruction in gunnery and torpedo work being only given on board the school-ships. Midshipmen and Naval cadets were during the whole term of their training under the supervision of the Inspector of Education. The latter was a flag officer, who in respect to educational matters controled the training-ships Stosch, Stein, Gneisenau, and Moltke, besides having direct control of the Naval School and the Naval Academy at Kiel. The object of the Naval Academy is to prepare officers for the higher positions in the service. The Kaiser Wilhelm Canal, commonly called the Kiel Canal, connecting the Baltic with the North Sea at Brunsbiittel, has its eastern entrance at Wik, 1-1/2 miles N. of Kiel. The town and adjacent villages, e.g. Wik, Heikendorf and Laboe, are resorted to for sea-bathing, and in June of each year a regatta, attended by yachts from all countries, is held. The Kieler Woche is one of the principal social events in Germany, and corresponds to the " Cowes week " in England. Kiel was connected by day and night services with Korsör in Denmark by express passenger boats. The harbour yielded sprats which were in great repute. The principal industries were those connected with the imperial navy and shipbuilding, but embrace also flour-mills, oil-works, iron-foundries, printing-works, saw-mills, breweries, brick-works, soap-making and fish-curing. There was an important trade in coal, timber, cereals, fish, butter and cheese. In the old town stands the palace, built in the i3th century, enlarged in the i8th and restored after a fire in 1838. It was once the seat of the dukes of Holstein-Gottorp, who resided here from 1721 to 1773, and became the residence of Prince Henry of Prussia. Other buildings are the church of St Nicholas (restored in 1877-1884), dating from 1240, with a lofty steeple; the old town-hall on the market square; the church of the Holy Ghost; three fine modern churches, those of St James, and St Jürgen and of St Ansgar; and the theatre. Further to the north and facing the bay is the university, founded in 1665 by Christian Albert, duke of Schleswig, and named after him " Christian Albertina." The new buildings were erected in 1876, and connected with them are a library of 240,000 volumes, a zoological museum, a hospital, a botanical garden and a school of forestry. The university, which is celebrated as a medical school, was attended by nearly 1000 students as of 1910, and had a teaching staff of over 100 professors and docents. Among other scientific and educational institutions were the Schleswig-Holstein museum of national antiquities in the old university buildings, the Thaulow museum (rich in Schleswig-Holstein wood-carving of the 16th and 17th centuries), the naval academy, the naval school and the school for engineers. The name of Kiel appears as early as the loth century in the form Kyl (probably from the Anglo-Saxon Kille = a safe place for ships). 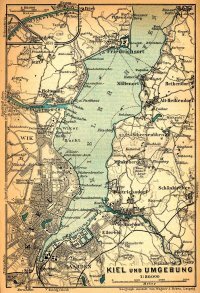 Kiel is mentioned as a city in the next century; in 1242 it received the Lübeck rights ; in the I4th century it acquired various trading privileges, having in 1284 entered the Hanseatic League. In recent times Kiel has been associated with the peace concluded in January 1814 between Great Britain, Denmark and Sweden, by which Norway was ceded to Sweden. In 1773 Kiel became part of Denmark, and in i860 it passed with the rest of Schleswig-Holstein to Prussia. Since being made a great naval arsenal, Kiel had rapidly developed in prosperity and population.